Ben Galley is a LibraryThing Author, an author who lists their personal library on LibraryThing. See Ben Galley's author page. About meAs far as BEN GALLEY is concerned, business cards are far too small. If they ever summoned the fortitude to be big enough, his would read something like: "Ben Galley - Professional Liar, Imagination Jockey, Daydream Merchant, and Teller of Tales so tall they make skyscrapers blush.” At the moment Ben’s simply says "Author". That does the job just fine. 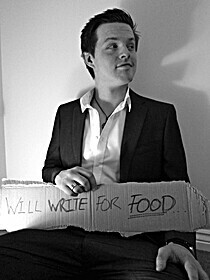 At 24, Ben is a young author from sunny England, and has been writing since he was old enough to be trusted with a pencil. He is the author of the dark and epic fantasy trilogy - The Emaneska Series. He has released two books to date and there is soon to be a third. During a stint at an esteemed music academy in 2007 and 8, Ben began to rediscover his childhood love of all things fantasy. It was at an opportune time, as the fantasy genre was seeing its brightest limelight for many a year. Inhaling book after book, a spark of inspiration was kindled inside him; a spark that rested on a childhood and youth well-spent writing short stores and books that would (mercifully) never see the light of day. Slowly, but surely, during studies, work, and displaying a level of procrastination that can only be dreamt of, the Emaneska Series was born. His debut The Written was finally unleashed on a snowy January in 2011. It was written mostly on Ben’s mobile phone whilst he worked behind a succession of bars and pasty vendors, each as depressing, and yet somehow inspiring, as the next. Its sequel - Pale Kings, was released to an eager audience in February 2012. Grittier and colder, it leaves The Written somewhat aquiver in its shadow. As an Indie publisher, Ben does everything by himself. He writes, edits, sketches the maps, manages tours, does the marketing... even this website was crafted by his very hands. Ben regularly tours the country doing signings and workshops, allowing him to meet a great many interesting people on his journeys. He is a frequent guest speaker and lecturer on the subject of self-publishing, and is eager to share his knowledge with everyone and anyone. He also writes self-help blogs and offers consultancy services on the subject too, which can be found at the brand new SHELF-HELP section of this website. Ben is incredibly zealous about inspiring other authors and writers. He recently released a clothing and merchandise line inspired by the Emaneska Series and his ethos. He wants to encourage others to turn their passion into their profession and follow their wildest dreams. Aside from writing and lecturing, Ben still dabbles in music, surfing, and apparently owns an acre on the moon. Ben can be found being loquacious and attempting to be witty on Twitter @BenGalley, or hiding in your garden shed. Enjoy.